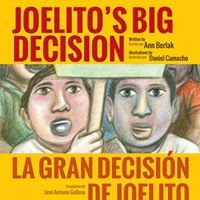 While world attention is focused on labor’s monumental “Fight for 15” struggle, Joelito’s Big Decision / La Gran Decisión de Joelito couldn’t have been published at a better time. Through the eyes of fourth-grader Joelito Sánchez and his friends, the story shows the impact of low-wage work on the lives of two families, while pointing to the importance of allies in the struggle. To the best of my knowledge, it’s the one picture book that addresses this particular issue in a way that will resonate with youngest readers and listeners. Joelito, whose mother, uncles and grandparents had been farm workers, is initially unaware of the poverty in his own urban neighborhood. His parents are making ends meet and, along with his sister, the four spend every Friday evening together at their favorite fast-food restaurant. But when Joelito and his family encounter a labor action of underpaid restaurant workers—some of whom are his best friend’s family and some of his neighbors—he learns about the issues and comes to recognize the necessity of standing with them. While the characters are fairly standard for a picture book, the text flows. In discussions between and among Joelito and his family and friends, and a conversation between a restaurant worker and a reporter, Berlak packs in a lot of information about underpaid workers exploited by arrogant and greedy zillionaire bosses (in this case, the ever-present image of “Sam McMann”), class struggle in general, and the “Fight for 15” in particular. In reality, I’m not sure there would have been this kind of dilemma for a Mexican-American child whose family had been involved in the farm worker struggles and whose friends and neighbors are low-wage restaurant workers. It’s more likely that he would have grown up with his family’s stories of oppression and struggle and now, encountering a picket line walked by his friends and neighbors, would have just picked up a sign and joined them. —Qué bueno que lo preguntas, Joelito –respondió la señora Thomas—. Hemos organizado esta protesta para que la gente sepa que MacMann’s no les paga a sus trabajadores un sueldo justo. Lo que pagan en MacMann’s no nos alcanza siquiera para mantener a nuestras familias. Queremos que nos paguen quince dólares la hora aunque ni siquiera eso es suficiente. Todo trabajador debería ganar lo suficiente como para poder pagar sus cuentas y tener unas vacaciones de vez en cuando. Kudos to all involved in this gigantically important little book. Joelito’s Big Decision / La Gran Decisión de Joelito is recommended.